Another storm blew through the farm and we’ve got another 12 inches of snow on the ground. It’s been bitterly cold and we’re craving comfort food. 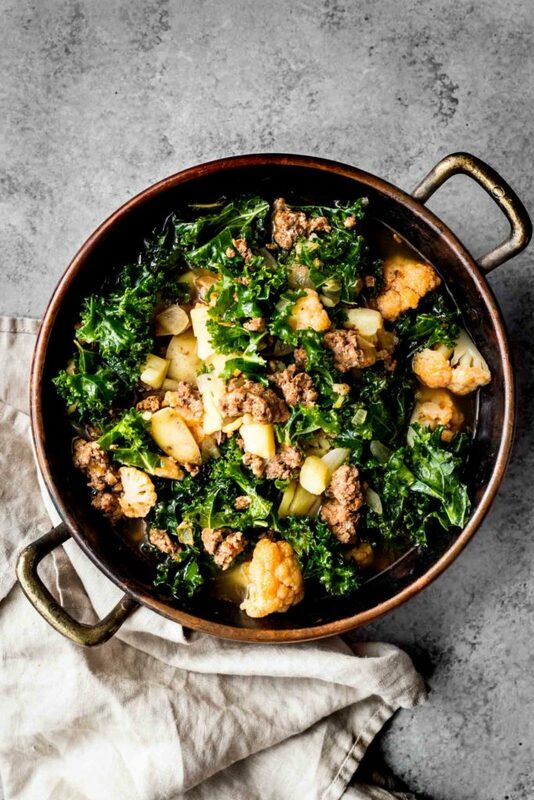 This kale and chorizo stew really hit the spot last night and we’re enjoying it again for lunch today. This stew is a breeze to prepare and gets even better the longer it sits. I love the spiciness from the chorizo, sweetness from the cauliflower and bitter bite from the kale. This is the kind of meal that makes me love quiet evenings at the farm watching the snow fall while cuddled up with bowls of piping hot stew. I hope you all enjoy nourishing dish as much as we do. It pairs really well with a glass of red wine and your favorite dinner date. In a large stock pot heat the oil over medium high heat. Add the onions, garlic and chorizo. Cook, stirring to break up the chorizo until the meat is browned up and the mixture is fragrant, about 5 minutes. Add the cauliflower and potatoes. Continue to cook, stirring occasionally, for about 2 minutes longer. Add the chicken stock, bay leaves, thyme and crushed red pepper flakes. Bring to a boil, then reduce the heat to medium low and simmer until the vegetables are tender, about 30 minutes. Add the kale and continue to cook until the kale wilts down a bit and turns bright green, about 5-8 minutes. Divide the soup between bowls and serve with parsley and salt and pepper to taste. This sounds wonderful. Will try today. Can’t wait for your cookbook. Andrea, in MA its 9 degrees. Not as blustery as your area but cold enough to warrant soup for dinner. I followed your recipe and this soup was delicious. A perfect blend of spice and veggies and heavy on the stomach. Our new favorite! Thank you for sharing the goodness! Does this recipe really require 3 quarts of chicken stock? It seems like a lot so I wanted to double check! Looks delicious! Yep! It’s a brothy soup. Feel free to add less at first and add more as needed– but 3 quarts is correct and works well. As with all my recipes feel free to make it your own. Taste test as you go and have fun! Happy cooking!